The Los Alamos National Laboratory (LANL) is located approximately 60 miles north of Albuquerque and 25 miles northwest of Santa Fe. It is situated on approximately 27,500 acres (approximately 40 square miles) in north-central New Mexico. 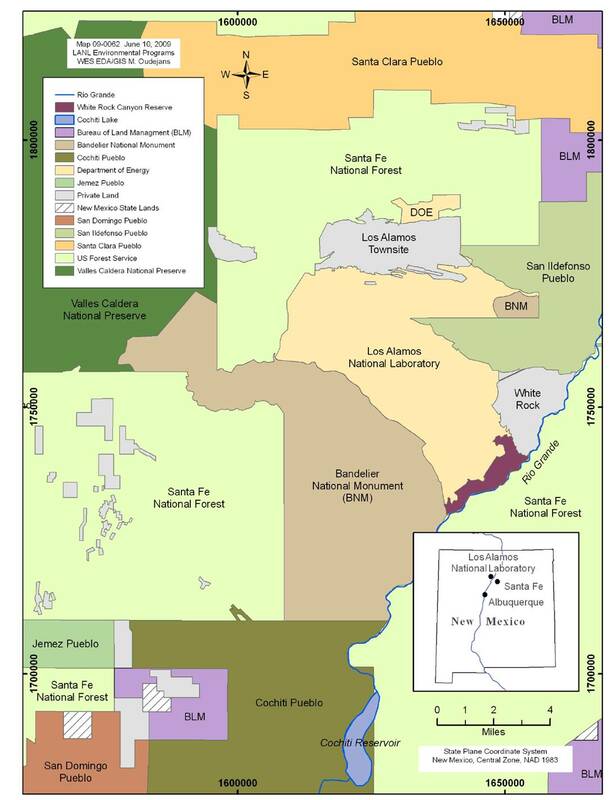 The LANL site is characterized by a series of narrow mesas and canyons on the western bank of the Rio Grande between the Jemez Mountains to the West and the Sangre de Cristo Mountains to the East. 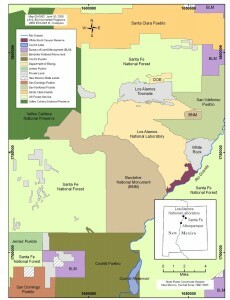 As shown in the map below, the Rio Grande flows southward along the eastern border of LANL into Cochiti Dam and Reservoir. Bordering LANL are the town of Los Alamos to the north, the Santa Fe National Forest to the west, Bandelier National Monument to the south, and the Pueblo de San Ildefonso, the town of White Rock, and additional Santa Fe National Forest land to the east. Originally referred to as the Los Alamos Laboratory during World War II, the site was renamed Los Alamos Scientific Laboratory in 1947 and received its current name, Los Alamos National Laboratory, in 1981. Scientific research began at LANL in March 1943 with the inception of Project Y of the Manhattan Project, the U.S. government’s effort to develop and test nuclear weapons. Nuclear-weapons research included the handling of, use of, and experimentation with a variety of radioactive materials. These practices led to the release of radioactive and hazardous substances into the surrounding environment. Operations at LANL have broadened beyond those pertaining primarily to nuclear weapons development and now include missions pertaining to “national security, energy resources, environmental quality, and science” according to the DOE. Expansion of site operations to achieve these goals has led to a corresponding increase in the type and volume of hazardous substances and oil discharged to the environment and the geographic area exposed to these contaminants. Hazardous substances and oil have been released into the environment as a result of normal operations and disposal activities, spills, and other discharges and releases at the LANL site. Historically, these contaminant releases have exposed various Trust resources, including air, soil, surface water, sediment and groundwater in and around LANL. More detail on site releases can be found in a variety of documents, including the Site-wide Environmental Impact Statement. Due to the nature of the scientific research and development and industrial activities performed on-site, hazardous chemical use (including solvents, acids, and elemental salts and compounds) has been a part of normal operations. In addition, environmental contamination has resulted from the on-site power, waste handling, and disposal facilities. In the 1980s, approximately 2,100 potential release sites were identified. Over the last several decades, a number of facilities have been decommissioned and remediated as part of LANL operations. In 2016, an updated consent order was finalized between the State of New Mexico Environment Department and the U.S. Department of Energy’s Environmental Management office, which guides the cleanup process at LANL. Currently, approximately 900 of the original 2,100 potential release sites have been determined to not require remedial actions. Approximately 860 sites remain a concern; 800 of which are currently undergoing remedial investigation/feasibility study activities. Remediation of the remaining 60 sites is currently being deferred, as LANL operations are still being conducted at these sites.